The cambelt is one of the hardest working components in an engine. Made from a rubber based compound that deteriorates with time, it should be checked and replaced every five years or as per the mileage specified in your Volkswagen / Audi service schedule – whichever comes first. 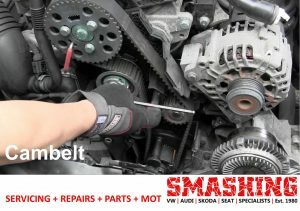 Cambelt replacement is a complex job, but by entrusting your car to us you can be confident that the work is being done by experienced trained technicians. We also recommend having the water pump replaced at the same time as your water pump is driven by the cambelt and provides circulation of the fluids which cool your engine. In some cases a water pump can seize, which can cause the cambelt to stop suddenly and break. For this reason, it makes sense to replace the water pump at the same time as the cambelt. Completing both jobs at the same time gives you total peace of mind and acts as a cost effective method.